He kept telling us that he was close, and that it wouldn’t be much longer before he started to see results on the golf course translate into victories. Some of us believed him, and some of us didn’t think he would ever win again. It had been 924 days since we last saw a PGA Tour victory from Tiger Woods, but his five-shot victory at the Arnold Palmer Invitational on Sunday definitely made a big statement. He’s on the way back. And his timing couldn’t be better, with the 2012 Masters Tournament just two weeks away. Will we ever see the Tiger-of-old? Who knows. You should consider this more of like a ‘Phase Two’ in his career, rather than a comeback. But one thing’s for sure, and that is that Woods is playing his best golf in three years to start 2012, and looks primed to win his fifth Green Jacket, when the best in the world descend upon Augusta National next week. So is Tiger the favorite? The answer is a resounding yes, as Woods overtook Rory McIlroy as the long favorite to win the Masters this year. Prior to, Woods and McIlroy had been in a deadlock as to who would be set as the ‘favorite’ to win. Woods is going off at 7/2 on 2012 Masters betting odds available at Bovada Sportsbook. McIlroy is set at 9/2. Both McIlroy and Woods have been playing very well of late, but oddsmakers continue to favor Woods, likely for several reasons. First, there is no substitute for experience. Even outside of the four times Woods has won at Augusta National, he has a track record of high finishes, tabbing a two top-five performances the last two years. And that was when he was still going through big swing changes. 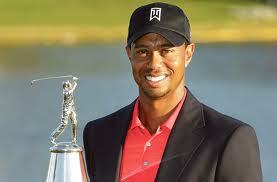 Now that he has it seemingly ironed out, there should be no reason why Woods will not play well. Second, Woods just won, and knows that this new swing can produce a victory. Combine that with his putting improving, and it’s really no wonder he is the favorite. Woods has never won the Masters if he had not won at least one PGA Tour event already that season. With just under two weeks to the Masters, Woods will be putting in the final work with swing coach Sean Foley, and if he continues to drive the ball like he has all season, it could be a runaway win for Woods. A fifth title would move him just one behind the all-time lead by Jack Nicklaus. This entry was posted in The Masters Future Odds and tagged 2012 masters odds, odds to win 2012 masters, tiger woods masters odds on March 27, 2012 by toprankadmin.